Lenovo's IdeaCentre Horizon Table PC could have a variety of applications in government in the future. The IdeaCentre Horizon Table PC is a 27-inch tablet that is the size of a coffee table. The product is described as an "interpersonal computer," rather than a "personal computer," according to its manufacturer, Lenovo. In the future, the machine could have a variety of applications in government. The company, which has its U.S. sales headquarters in Morrisville, N.C., introduced the Horizon product at the 2013 International Consumer Electronics Show the second week in January. The computer is a multi-user, multi-touch, multi-mode device that allows users to turn their personal computing experience into a shared computing experience. As a Table PC, the Horizon can lie flat on any surface, lets two or more people use the screen at the same time, supports interactive physical gaming accessories, and is designed for touch screen game-play among several players. Horizon takes advantage of Windows 8 touch functionality to bring customized games from Electronic Arts and Ubisoft to life. Horizon can also easily transform into a 27-inch high-performance desktop to handle whatever productivity tasks users need to do. And those tasks could include government applications, such as staff meetings at city hall, emergency response posts and military strategy sessions. The Horizon could be used to facilitate planning and discussions among disaster response units. Doug Augustine, a manager in global corporate communications at Lenovo U.S., told Govpro that the Horizon could work in a variety of government applications, "as long as the specific software was compatible with the Windows OS." The computer landscape is evolving, said Peter Hortensius, president, Product Group, Lenovo. "We've seen technology shifts across the four screens, from the desktop to the laptop, tablet and smartphone, and yet, while people have more computing power than ever before, there is still room for technologies like Horizon that bring people together." Hortensius said Horizon enables several people to share collaborative experiences. "Now many people can enjoy different photos, music and video on the same screen, and they can play games with our special accessories that blend physical and digital interaction." The Horizon Table PC offers the power of Windows 8 and brings multi-player games and activities to life with its large screen, dynamic graphics and 10-finger touch. The system includes the Lenovo App Shop, a dedicated apps store, and access to a package of pre-loaded educational and gaming apps from a variety of vendors. With Horizon's smart hinge system, users can lay the unit flat and in so doing, the Lenovo Aura multi-user, multi-touch interface (UI) will automatically activate. The UI lets workgroups, families and others play, learn or enjoy multimedia content together on one screen. The Horizon unit also can serve as a workgroup's main all-in-one desktop. Its large backlit screen can be seen from virtually any angle and its NVIDIA GeForce graphics make content look lifelike with smooth and seamless video playback, graphics and Dolby Home Theatre v4 audio. Intel Core i7 processors power the Horizon unit. As an option, Horizon offers a moveable and space-saving Horizon Multimode Table. The adjustable table allows users to change the angle and height position of the Table PC, from lying flat to a straight-up, 'wall-like mount' at 90 degrees. The IdeaCentre Horizon Table PC will be available beginning in early summer through Lenovo business partners and www.lenovo.com. Prices start at approximately $1,699. 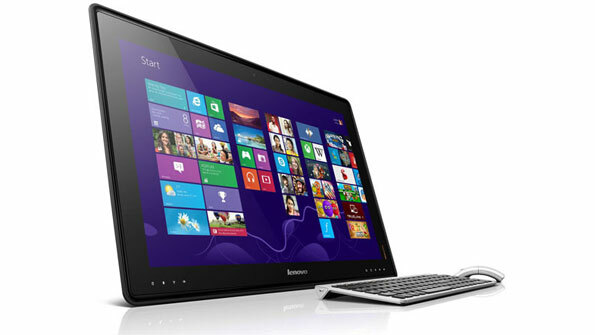 At the consumer electronics show, Lenovo also demonstrated a large 39-inch wide-screen Table PC, code-named "Gamma." Other vendors that offer king-sized table PCs include Sony Corp., which has released the Tap 20, an all-in-one PC that also lies flat. But the unit is smaller than the Lenovo model, at 20 inches diagonally. Microsoft Corp. offered the first table PC with the Surface, a PC with a 30-inch touch-sensitive screen, that it released in 2008. The product, which is now called PixelSense, was designed for store displays and other commercial and government applications.